Captivate the look and feel of a nature-inspired forest in any room with Birch Trees Peel and Stick Decor by RoomMates. Fast, fun and affordable, give walls, decor and accessories a speedy transformation with very little effort. Great for DIY projects, temporary home decorating and more, Peel and Stick Wallpaper is an effortless way to transform any space or decor in minutes. Simply peel from the backing and stick to any clean flat surface. Best of all, Peel and Stick Decor can be removed in seconds (without damaging painted walls and without leaving any sticky residue behind). Reuses again on walls or for DIY projects. Its a decorating solution that tops them all! Shop fresh new designs for your home today! Cute jungle friends meet your little ones room decor with Kathy Davis Animals on Parade Wall Decals by RoomMates Decor. Immediately grab your childs attention with these playful animal wall decals. Have fun with cheerful giraffes, sweet loving elephants, adorable turtles, and playful lions the moment you hang this jungle inspired decor. Featuring colorful silhouette images of jungle animals, instantly bring a safari scene to your decor with a fast and easy peel and stick application process. To apply, just peel each wall sticker from the backing and apply to any smooth, flat surface of your choice. Remove and reposition as much as needed keeping walls free of any sticky residue. Best of all, reuse these officially licensed Kathy Davis wall decals over and over again. Bring an adventurous jungle scene to your childs room decor today! From the television straight to our childs wall, delight Disney The Lion Guard fans of all ages in a way like no other with our peel and stick Disney The Lion Guard Wall Decals. This The Disney Lion Guard Wall Decal set includes all of your childs favorite characters. Fast, fun and affordable, each Disney The Lion Guard wall decal set comes with a 30 elements; enough to cover an entire room! Printed on high quality vinyl, the installation process is a cinch - just peel and stick! Each wall sticker is removable and repositionable making them 100% safe for walls! Frozen Wall Decals Removable and repositionable, these wall decals can be applied to any smooth, flat surface. To apply, peel each decal from the backing and place on your desired surface. Our decals will never damage your walls or leave behind any sticky residue, no matter how many times they're repositioned. 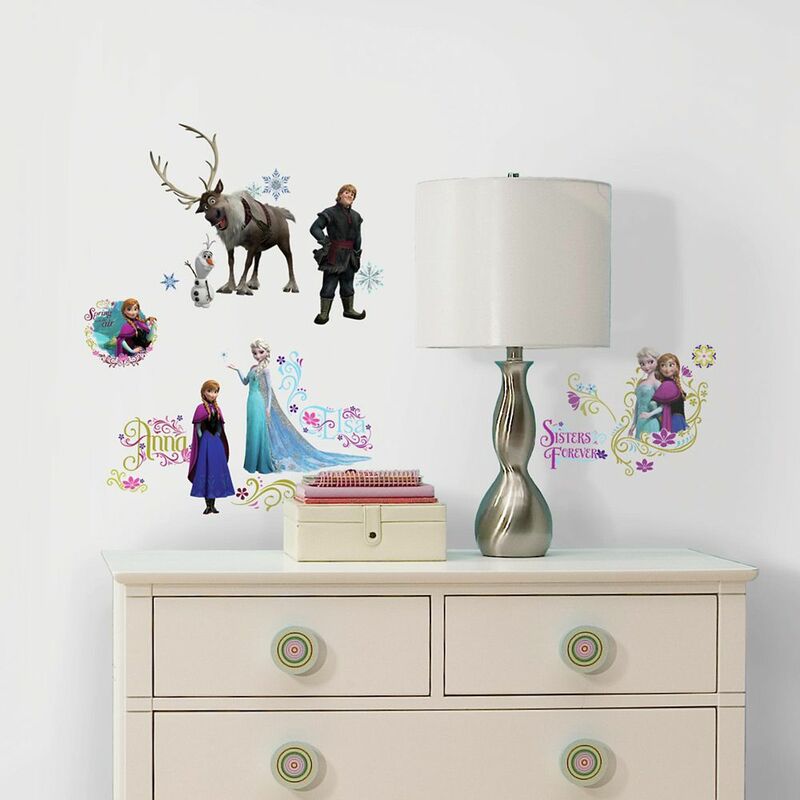 Frozen Wall Decals is rated 4.7 out of 5 by 15. Rated 5 out of 5 by Dan from We bought this for our granddaughter's room in our house. She loves it. Easy to use and sticks well. We bought this for our granddaughter's room in our house. She loves it. Easy to use and sticks well. Rated 5 out of 5 by Buffalo from My 3 year old granddaughter was thrilled to have... My 3 year old granddaughter was thrilled to have these decals added to her pink room! Rated 5 out of 5 by Remo from Very easy to use, our walls are textured and the adhered very well. Didn't know what to expect wh... Very easy to use, our walls are textured and the adhered very well. Didn't know what to expect when I bought them but they worked very well and grand daughter is smiling from ear to ear. Rated 5 out of 5 by Striker1 from Bright ens up a room and easy to install So many stickers and so easy to peel and stick. It brightened up my daughters room in an instant. Rated 5 out of 5 by JC from Good purchase Pleased with my purchase. Looked great. Seemed easy to use. Rated 5 out of 5 by Me76 from My Nieces Love It!!! Easy to put on and peel off if you make a mistake and are able to redo it again.